Harry Charles Salusbury Lloyd (born 17 November 1983) is an English actor. 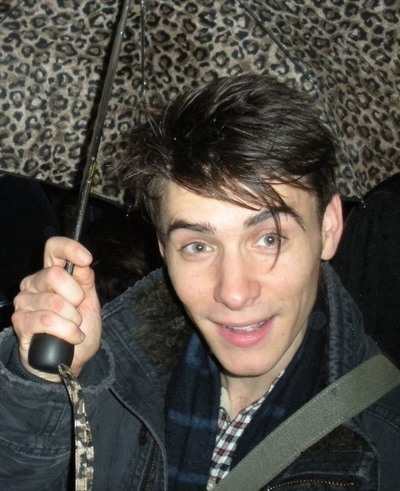 He is known for his roles as Will Scarlet in the 2006 BBC drama Robin Hood, Jeremy Baines in the 2007 Doctor Who episodes "Human Nature" and "The Family of Blood", and Viserys Targaryen in the HBO series Game of Thrones. He has also appeared on stage, and in films including The Theory of Everything and Anthropoid. He is the great-great-great-grandson of author Charles Dickens. Lloyd was born in London, the son of Marion Evelyn (née Dickens), a children's publisher, and Jonathan Lloyd, who heads a literary agency. He is a great-great-great-grandson of the Victorian writer Charles Dickens through his mother, who is the daughter of Captain Peter Dickens, RN. His maternal great-grandfather was Rear-Admiral Henry Blagrove. He is the cousin of biographer and writer Lucinda Hawksley, and actor and performer Gerald Dickens. Lloyd was educated at Eton College and, while there, made his television debut at the age of 16 as James Steerforth in the BBC's 1999 adaptation of David Copperfield opposite Daniel Radcliffe. In 2002, he was cast as young Rivers in Goodbye Mr Chips. He went on to study English at Christ Church, Oxford, where he joined the Oxford University Dramatic Society and appeared in several plays like Kiss of the Spider Woman and The Comedy of Errors. He toured Japan with The Comedy of Errors for the society's 2005 summer tour, starring alongside Felicity Jones. He left the University of Oxford in 2005, graduating with an upper second-class degree. In 2007, Lloyd made his professional stage debut at the Trafalgar Studios in A Gaggle of Saints, one of three short plays that make up Neil LaBute's Bash, for which he received many positive reviews. He played Jeremy Baines, a student whose mind is taken over by a species of aliens called the Family of Blood, in the Doctor Who episodes "Human Nature" and "The Family of Blood". He was suggested as a possible candidate to play the Doctor when David Tennant left the role. In 2011, Lloyd appeared as Viserys Targaryen in the HBO series Game of Thrones. He also appeared in the BBC comedy Taking The Flak, and as Herbert Pocket in Great Expectations. He had small roles in Jane Eyre and The Iron Lady, and starred as the son of a gangster in The Fear, which aired on Channel 4 in December 2012. In 2012, he appeared as Sir Edmund Mortimer in the BBC television film The Hollow Crown: Henry IV, Part 1, and he played Ferdinand, The Duke of Calabria, in The Duchess of Malfi at the Old Vic in London. He took on his first leading role in the feature film Closer to the Moon, released in 2014. Lloyd also appeared as Stephen Hawking's fictionalized roommate Brian in the Best Picture-nominated film The Theory of Everything, alongside Academy Award winner Eddie Redmayne and Academy Award nominee Felicity Jones. In 2015, Lloyd co-created the web series Supreme Tweeter, in which he stars as a fictionalized version of himself. The following year he played Adolf Opálka in the epic war film Anthropoid, also starring Jamie Dornan and Cillian Murphy. He also appeared in the ITV series Marcella. He returned to the stage for the production Good Canary at the Rose Theatre, which was directed by John Malkovich in the role of the protagonist. In 2017, he filmed for the part of Peter Quayle in the upcoming series Counterpart with J. K. Simmons. He also stars in the upcoming 2017 film The Wife, an adaptation of the book by Meg Wolitzer with Glenn Close and Jonathan Pryce.